Welcome to the Internet home of the Ridgway Area School District. 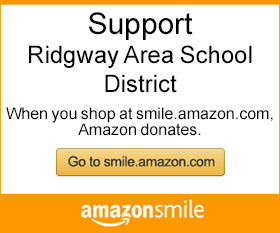 Together, the three schools that comprise our district provide a safe, empowering learning environment for kindergarten through 12th grade students in Ridgway, Pennsylvania. Thank you for taking the time to visit our website. We are happy to provide you with information about our district, our elementary school, our middle and high school, and the excellent programs and services we offer our students. On January 14, 2019, the Pennsylvania Office of Attorney General (OAG) and the Pennsylvania Department of Education (PDE) rolled out the Safe 2 Say Something (S2SS) program. The purpose of S2SS is to teach people how to recognize and report at-risk behaviors. According to the statistics presented by the OAG, there were warning signs that preceded the majority of violent acts in school settings. For example, 80% of school shooters told someone of their plans and 69% told more than one person. The planning for mass shootings often takes more than 6+ months. Up to 70% of the people who complete suicide tell someone of their plans or give warning signs. S2SS is an anonymous tip line. Individuals can report concerns via an app, website, or crisis hotline. These can be accessed via app (access at Google Play or App Store) - Safe2SayPA; hotline 1.844.SAF2SAY; or Say Something website. All tips go directly to the OAG, where dispatch teams process the information. The dispatch teams, consisting of trained counselors, report the tips to the local school district and the local emergency services (911 center) based on whether they classify the tip as a life safety tip or non-life safety tip. They report life safety tips to the school team and local emergency services 24/7 via a direct phone call. They report non-life safety tips to the school team via a text and/or email between the hours of 6:00 a.m. and 7:00 p.m. Both agencies assess and intervene (as needed). For life safety tips, the school works in collaboration with local emergency services to ensure intervention and follow up through the closure of a tip. The district fully supports the OAG's initiative and believes that it has great potential to reduce risks to youth and staff in the school settings. The district will be holding a community town hall meeting on the topic of school safety on Tuesday, February 26, 2019, at 7:00 p.m. in the elementary school library. Those interested in attending can RSVP to Amy Ellis, RASD Superintendent's Office, at 814.773.3146 or by email. We invite you to learn more by reading this recent superintendent's letter in full.